The church where George Washington worshipped is removing a plaque honouring the memory of America’s first president in the latest example of the way historic monuments are influencing contemporary politics. “The Vestry has unanimously decided that the plaques create a distraction in our worship space and may create an obstacle to our identity as a welcoming church, and an impediment to our growth and to full community with our neighbours,” church officers said in a letter to the congregation following a month-long consultation period. Washington was one of the congregation’s founding members in 1773, paying for pew number five, while General Lee’s daughter left the church $10,000 in her will. 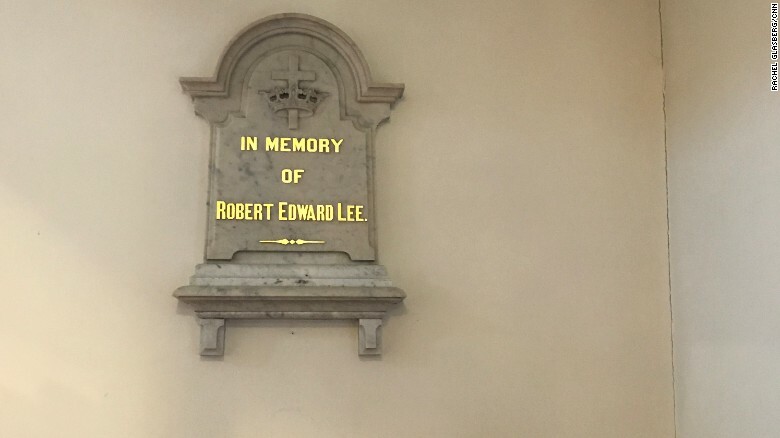 The two plaques have hung on either side of the altar since 1870, soon after Lee’s death, paid for by city residents. Probably a wise move. Their mission is religion, not history. Original Quill wrote: Probably a wise move. Their mission is religion, not history. Should we then remove all statues of Jesus, being as its written he will come back and commit genocide, wiping out a third of humanity? Kind of a wierd mission don't you think? Iconoclasm has had its place in Christianity. Wiki wrote: "Thou shalt have no other gods before Me" (Hebrew: לא יהיה־לך אלהים אחרים על־פני‎) is one of the Ten Commandments found in the Hebrew Bible at Exodus 20:2 and Deuteronomy 5:6, which establishes the exclusive nature of the relationship between the nation of Israel and its national god, Yahweh the god of Israel, a covenant initiated by Yahweh after delivering the Israelites from slavery through the plagues of Egypt and the Exodus. When you go through the cities of Greece and the former Roman Empire, you see so many statutes--many of the Christian statutes--that were destroyed because of this edict. Muslims still abide by it, as witness the Charlie Hebdo attack. No other images before god... is a biblical rule. No sense in altering a centuries-old canonical legal doctrine, when you can get rid of a few meaningless statutes just as easily. Again, history is not the mission of the church. My point went so far over your head, its clearly cleared the moon? So you are abandoning it? Score!! I am waiting for the penny to drop for you. Clearly it has not done so yet. Exodus 20:2-17 wrote: You shall not make for yourself a carved image, or any likeness of anything that is in heaven above, or that is in the earth beneath, or that is in the water under the earth; you shall not bow down to them nor serve them. For I, the Lord your God, am a jealous God, visiting the iniquity of the fathers on the children to the third and fourth generations of those who hate Me, but showing mercy to thousands, to those who love Me and keep My Commandments. It's a strong prohibition in the abrahamic religions. On church grounds, it could be interpreted as sacrilege. Elevating a political figure to the status of god is a clear violation of the first and second commandments. But we don't need to get into ecclesiastical matters to argue that having statutes of political figures on church grounds is a bit of mission-creep. Political figures have nothing to do with religion. Indeed, the First Amendment forbids religion for government-side properties. It is simply unnecessary for churches to go there, and to attempt to justify it is for political issues to mix with religion. Maybe also Quill can explain the stations of the cross in churches, images of Mary as well? Showing his point is so dumb, it deserves an award for stupidity. Even more so when this is not about images. Didge wrote: Maybe also Quill can explain the stations of the cross in churches, images of Mary as well? Of what relevance is all that? How does some poetic references found in the Bible justify statutes of political figures in church grounds? The Bible is a collection of folk tales, providing at best some context. "Dumb?" "Stupidity?" "Crap on a cracker?" Adjectives are not arguments. Statues are inanimate images. Ecclesiastically, they are viewed negatively in some schools. Politically, religious images are prohibited in government structures by the First Amendment. An political image on church property is a form of sacrilege; at best, it furthers no religious purpose, except to elevate someone to the status of god...a violation of the first and second commandments. Best to remove political images from church grounds. You're reaching for rescue lines now, didge. Relevant religious images are prolific in churches. Political images have no relevance. When you have something further to contribute to this thread, I'll be back. However, I'm not interested in repetitive arguments and rude adjectives. Original Quill wrote: You're reaching for rescue lines now, didge.